Fall and Thanksgiving is a time when I personally love to begin my decorating for the holidays! In my house that means bringing out my Annalee Thanksgiving and Fall collection. In this category you will find Annalee Thanksgiving dolls and animals of all kinds. 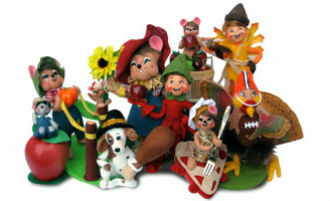 Shop Thanksgiving Elves, Angels, Pilgrims, Angels, Mice and other Animals, and much more. I hope I can share the passion of Annalee Doll collecting with you and your family. Annalee Doll Description: Open eyes, ooh mouth - as shown, brown hair, halo accented with leaves, burnt orange velour gown, cranberry ribbon, orange satin belt accented with leaves, beige base. Annalee Doll Description: Last one. Open eyes, closed mouth smile - as shown, brown hair, halo accented with leaves, burnt orange velour gown, cranberry ribbon, orange satin belt accented with leaves, beige base. Annalee Doll Description: Tan body, green burlap hat, fall print shirt, brown pants, holds hay, green base. Facial expression and fabric used on shirt and pants may vary. Annalee Doll Description: Open eyes, black body, mustard-colored beak and feet, burlap hat, wings have two patches on them. Compliments any of the scarecrows. Made in Meredith, NH USA. Annalee Doll Description: Open eyes, mouth expressions may vary, orange hat and body, holds rake. Rake is sold as is. The green rubber that holds the prongs has become distorted through time and may not hold them in place. Great for Fall displays. Annalee Doll Description: Open eyes, ooh mouth, orange pumpkin, green burlap hat, straw hair. Companions are 300010 and 300910. Annalee Doll Description: Last one. Closed mouth with one tooth - as shown, mustard-colored face and hands, natural colored burlap hat, blue stone washed overalls, red and white dot shirt, white shoes, green felt base. Very common for slight discoloration of the green on the base through the years. Companion is 307394. Annalee Doll Description: Last one. Closed mouth with one tooth - as shown, mustard-colored face and hands, natural colored burlap hat, blue stone washed overalls, red and white dot shirt, white shoes, green felt base. Slight fading on top of green base which is very common. Girl Scarecrow companion is 307394. Annalee Doll Description: Open mouth with two teeth, mustard-colored face and hands, natural colored burlap hat, blue stone washed overalls, red and white dot shirt, white shoes, green felt base. Very common for slight discoloration of the green on the base through the years. Companion is 307394. Annalee Doll Description: Star eyes, open mouht with two teeth, mustard-colored face and hands, natural colored burlap hat, blue stone washed overalls, red and white dot shirt, white shoes, green felt base. Slight fading on top of green base which is very common. Girl Scarecrow companion is 307394. Annalee Doll Description: Grey bodies, cranberry and white Pilgrim outfits, hold basket filled with corn or pumpkins. Slight discoloration on white due to age which is very common. Facial expressions may vary. Annalee Doll Description: Last one. Open eyes, mouths - as shown, grey bodies, cranberry and white pilgrim outfits. Shows signs of being displayed - slight discoloration on white and overal shelf dust. Perfect dolls to add to a wreath or spray for your front door or floral arrangement. Annalee Doll Description: Grey bodies, brown and white pilgrim outfits, hold basket filled with corn or pumpkin. Basket may come with or without handles. Facial expressions may vary. Annalee Doll Description: Last one. Open eyes, open mouths - as shown, grey bodies, brown and white pilgrim outfits. Shows signs of being displayed - slight discoloration on white and overal shelf dust. Perfect dolls to add to a wreath or spray for your front door or floral arrangement. Annalee Doll Description: Last one. He has closed eyes, close mouth with tooth, she has open eyes, closed mouth with tooth - as shown, grey bodies, brown and white pilgrim outfits, hold basket filled with corn or pumpkin. Annalee Doll Description: Last one. Open eyes, mouth expressions may vary, grey bodies, green and white outfits, holds basket of vegetables. Annalee Doll Description: Open eyes, closed mouth, beige face, tan burlap hat, leaf print suit accented with hay. Annalee Doll Description: Open eyes, open mouth with one tooth, beige face, tan burlap hat, leaf print suit accented with hay. Annalee Doll Description: Open eyes, open mouth with two teeth, tan burlap hat, leaf print suit accented with hay. Annalee Doll Description: Open eyes, closed mouth, brown hat, green plaid outfit, green and beige stripe vest, brown felt base. Country Bumpkin. Annalee Doll Description: Open eyes, closed mouth with one tooth, brown hat, green plaid outfit, green and beige stripe vest, brown felt base. Country Bumpkin. Annalee Doll Description: Open eyes, open mouth with two teeth, brown hat, green plaid outfit, green and beige stripe vest, brown felt base. Country Bumpkin. Annalee Doll Description: Last one. Open eyes, closed mouth, auburn hair, leaf print dress, blue stone washed denim apron, blue shoes, green felt base. Very common for slight discoloration of the green on the base through the years. Companion is 304789. Annalee Doll Description: Last one. Open eyes, closed mouth with one tooth, auburn hair, leaf print dress, blue stone washed denim apron, blue shoes, green felt base. Very common for slight discoloration of the green on the base through the years. Companion is 304789. Annalee Doll Description: Open eyes, open mouth with two teeth, auburn hair, leaf print dress, blue stone washed denim apron, blue shoes, green felt base. Very common for slight discoloration of the green on the base through the years. Companion is 304789. Annalee Doll Description: Last one. Open eyes, closed mouth with tooth - as shown, auburn hair, leaf print dress, blue stone washed denim apron, blue shoes, green felt base. Very slight fading on top of green base which is very common. Companion is 304789. Annalee Doll Description: Last one. He has closed eyes, open mouth - laughing, she has open eyes, closed mouth smile with tooth, grey bodies, blue and plaid pattern outfits. Basket may come with or without handles. Note: facial expression is different than photo. Annalee Doll Description: Open eyes, open mouth - as shown, black hair, white hat and apron, blue plaid dress. Tag dated '94. Annalee Doll Description: Last one. Open eyes, open mouth - as shown, grey body, black hair, white hat and apron, brown dress, holds basket of vegetables. Companion is 3080. Annalee Doll Description: Last one. Open eyes, closed mouth, grey body, black hair, white hat and apron, green plaid dress, holds basket of vegetables. Companion is 308091. Note: mouth expression is different from photo. Annalee Doll Description: Last one. Open eyes, open mouth, grey body, black hair, white hat and apron, green plaid dress. Companion is 308091.